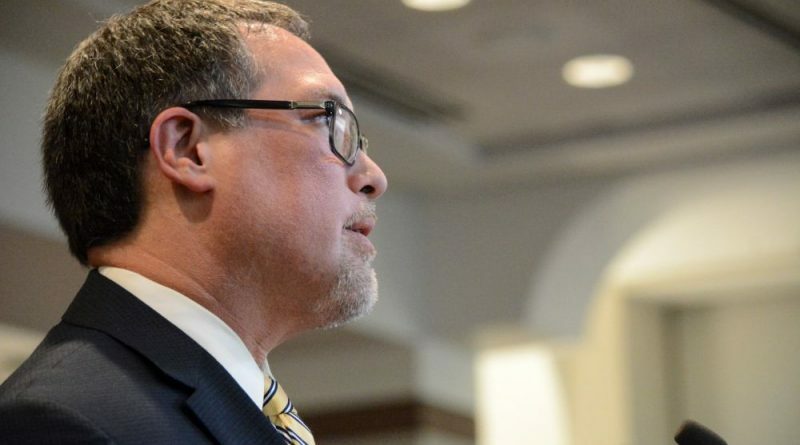 County Administrator Tim Hemstreet brought supervisors good news about the county’s financial outlook while presenting his fiscal year 2020 budget Wednesday. Supervisors had directed Hemstreet to prepare a budget at the equalized tax rate, or the rate at which the average real estate owner would pay the same dollar figure despite rising property values. At the time, there was concern about an anticipated $28 million gap in the School Board’s funding request, and worry about whether that tax rate would bring in enough money to cover the county’s ambitious project to catch up on pay scales and staffing levels after years of falling behind Loudoun’s population growth. Supervisors also asked for options to raise or cut the tax rate by another two cents—worth about $8.6 million in tax revenues for each penny. This year’s equalized rate is $1.045 per $100 of assessed value, a four-cent tax rate cut from the current rate of $1.085. But Hemstreet told supervisors Wednesday that his proposed budget meets every county priority at that tax rate. Even the if supervisors decide to raise taxes above the equalized rate, Hemstreet has not provided them options to raise them by more than a half cent, in large part, he said, because the schools’ budget request coming lower than expected. The School Board typically makes a budget request higher than the money county supervisors advises it expects to have available, but this year the school budget request was within the county’s fiscal guidance. By placing legal advertisements at a rate of $1.055 per $100 of assessed value, Hemstreet has capped supervisors’ options for raising taxes unless they delay their budget deliberations by advertising a higher rate. Hemstreet said the county’s strong financial position is also attributable in part to continued growth in tax revenues from data centers, and a long economic boom both in Loudoun and the country. At the same time, Hemstreet warned against cutting taxes as the county government works to catch up to Loudoun’s growth. Doing so, he said, would mean cutting into service levels, getting in the way of the goals the Board of Supervisors has set. Supervisors had generally positive reactions to the budget news from Hemstreet. The day after launching his bid for a seat in the state senate—and days after outgoing Board of Supervisors Vice Chairman Ralph M. Buona (R-Ashburn) gave his own board a “B+” for staying nonpartisan, and advised the next board to do the same—Supervisor Geary M. Higgins (R-Catoctin) said the county’s good budget news is attributable to Republican leadership, which he credited for investments in economic development. “I have to say, I don’t normally get political—this has been under the control of two Republican boards, starting in 2011,” Higgins said. He also warned supervisors not to forget about Loudoun’s rural businesses. Buona gave much of the credit for the county’s financial success to its government staff members. Hemstreet’s proposed $3.2 billion budget includes $2 billion in operations, the majority of which goes to the schools. The biggest growth in the budget comes from the second of a three-year process to update the county’s classification and compensation system for government employees. This year, Hemstreet is proposing $25 million toward that project, including $7.9 million for the county’s merit pay program; $6.1 million for an across-the-board 2 percent pay raise for county employees; and another $11 million for particular positions to bring them in line with market pay rates. Over this board’s term, Hemstreet said, the county government has added more than 400 jobs. 11.2% increase request from LCPS!!!!!!!!! That’s obscene. LCPS received $1189M in funding last year. But in this request, they acknowledged the FY19 request was inflated by $19M in healthcare and $15M in FTE’s. They simply never needed that money. Thus, their expenditures for FY19 would be no higher than $1,155M. Yet, they are asking for $1,284M for FY20, an increase of $128M! That’s 11% more than just one year ago but they only have 0.2% more kids? I guess if enrollment dropped by 5%, LCPS might ask for 20% more spending. This is immoral and unethical. The BOS needs to punish the whiny brats in the castle immediately.